According to the Milwaukee Business Journal, the state of Wisconsin remains the absolute worst place for black people to live. Yes, good old Wisconsin, the "cheese capital of the world," surrounded by two Great Lakes and full of forests and farms. According to the Wisconsin Department of Health Services, nearly 90 percent of Wisconsin's black population lives in six Wisconsin counties: Milwaukee, Dane, Racine, Kenosha, Rock and Waukesha. So why is this state the worst for them? #1 - Highest unemployment rate: Wisconsin has the highest national unemployment rate among all black Americans - the black unemployment rate is 11.1 percent, compared to 4.1 percent for white residents. Compared to other states, Blacks in Wisconsin are twice as likely to be unemployed. 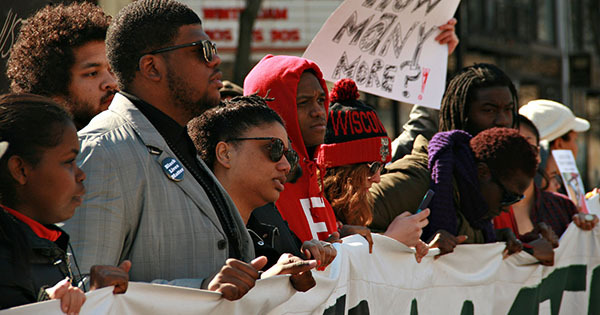 #2 - Lowest education rate: Wisconsin has one of the lowest education rates for blacks - only 12.8 percent of black adults in Wisconsin have completed college, compared to 29.9 percent of white adults in Wisconsin, and 19.7 percent of black adults nationwide. #3 - Lowest income rate: Wisconsin has one of the lowest income rates for blacks - median income for blacks in Wisconsin is less than half of that for whites -- $26,053 compared to $56,083 for whites. But Wisconsin is not the only state that is not so good for African Americans. Minnesota comes in at #2, Illinois comes in at #5, and the state of Iowa comes in at #10.